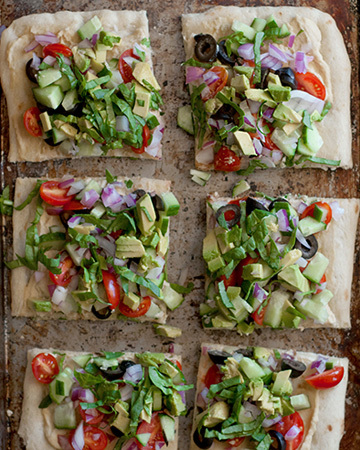 A delicious Mediterranean spin on pizza! Pita bread or flat bread is topped with flavored hummus, then fresh crisp veggies are added, making this pizza guilt free and figure friendly. The added bonus? It’s a no-bake recipe, making it light, cool and refreshing for the summer. On each of the pitas/flatbreads begin layering all of the veggies, one by one, until they are all assembled. Top with feta cheese and fresh herbs. Serve immediately.